Do you know the most common mistake of first-time entrepreneurs? They don’t spend nearly enough time getting to know their target customer. When you are starting your business for the first time there are so many different things you can do to get started, but focusing on the needs of your customers is the best use of your limited time and energy. I get loads of questions on a weekly basis about how to start a business. Most people ask me questions about what legal entity they should create, how to set up their website, how to create a brand, what accounting software to use, etc. None of that matters until you’ve had a one-on-one conversation with at least 50 of your target customers. I’m serious. There’s a ton of truth to that! I think people believe doing business means focusing on all the stuff that sounds like you are starting a business. It’s like kids playing house. It makes you feel like you are doing something for your business, but in reality you are avoiding the most crucial activity to get it started: talking to potential customers! 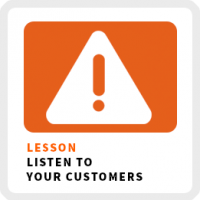 When you are starting out, at least 80% of your time should be spent listening to your potential customers. Your best information will come from one-on-one conversations or even conversations in small groups of three or so people. How does this make your life or work more difficult? What are you currently doing to solve this problem? What do you like about that solution? What don’t you like? What do you wish exists that currently doesn’t exist? How much money are you willing to pay to have this problem solved? That simplest of questions will reveal a treasure trove of information that will help you really figure out how to find a unique solution to their problem. As you dig into your research, you will eventually come across what I call “The Magic Question”. What makes it so special? It gets the people with the problem you are trying to solve to open up very quickly. As soon as they hear the question, they can’t wait to tell you exactly how they feel! That one question has helped me understand the needs of people like yourself and how I can help you, better than any other question I asked previously! Depending on the problem you are trying to solve, it will be different for each business idea. Keep trying different questions and keep an ear out for the one question that really gets them talking! It’s almost as if you are giving them permission to vent. To get a load off their mind. They’re almost begging you to ask the question! At the end of the day, each one of us wants to feel heard, especially when someone is interested in a problem we are struggling with. Even if you are still seeking a problem to solve, as you come across ones that spark your interest, find a few people with that problem and talk to them. And thanks to the miracle of the Internet and social media, it’s never been easier to find and talk to your target customers! If you have talked to less than 50 potential customers, then you should be doing nothing else on your business until you do. The more you talk to them, the easier it will be to make the rest of the decision you need to tackle to get your business off the ground. Trust me!